Hello! Hi! Vanakkam! Namaste! Zdravstvuj! Welcome to CUMIN NATURE — a blog dedicated to healthy and flavorful vegetarian cooking that is so easy a human could do it. Even my human daughters, whom I connect with via texts about food because that is much easier than getting them to call me back. My name is Kalyani. I’m an Indian-American mother and wife living outside Philadelphia. I’m joined on this blog by daughters, who are the technical and creative brains of this outfit. Together, we are die-hard, humane-conscious, flavor-kicking, veggie-busting eaters. The more you follow us, the easier it will be for you to decipher which Hogwarts house we belong to (hint: they are all different. another hint: not Slytherin, not Slytherin, not Slytherin). Like many American families, mine likes to congregate around the kitchen table. Since my kids left the house over a decade ago, they’ve sent me multiple text messages of the “Mom, how do I make that thing you make” variety. I also began to receive friendly questions while perusing my local grocery stores on specific Indian cooking ingredients and techniques from strangers. Somehow, word got out across many ponds of the wonderfulness and warmth of Indian food. 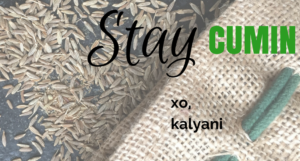 From the encouragement of my daughters and husband, I decided to start a blog that chronicles my cooking escapades and sheds light on what authentic and healthy Indian cooking looks like and tastes like. I might even dispel some myths along the way. This blog is about making healthy food EASY and DELICIOUS and ATTAINABLE. It won’t be a blog where I tell you to eat one almond, drink the juice of a cucumber and then go to bed hungry. I care about whole foods and colorful plates. I want you to feel full, warm and eager for more goodness. In this blog, I will document my cooking exploits in a super easy format. Yes, Indian food happens to be my perspective to achieve these wonderful plates. But by no means is that all I do. I hope that, through this journey, you’ll understand how powerful you are in your own kitchen with just a few simple tools. College student without a fully-stocked kitchen? I got you. Busy professional without free evenings to cook? Give me no more than 20 minutes. Lazy person? I can help you too, but I warn you now, it requires getting off the couch! You may eventually find yourself cooking more, impressing your frozen-meal friends, and eating out less. Please join us on this ride! If you ever have any questions, our contact page is wide open, and we’ve learned a thing or two about social media. We tried the 7-day cabbage soup cleanse – here’s what happened!